Your TGI Fridays℠ Gift Card may only be used for making purchases at participating TGI Fridays℠ restaurants. It cannot be redeemed for cash or applied as payment to any account unless required by law. This Card is not reloadable. This card will only be replaced if an original sales receipt, valid identification, and original card number are provided. Use of the card constitutes acceptance of these terms and conditions. No dormancy fees. 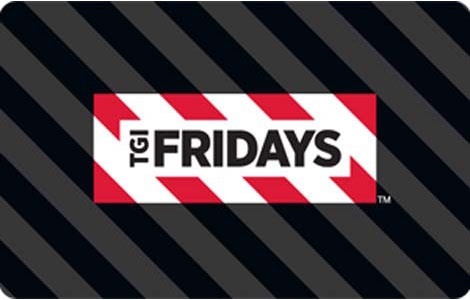 For more information about the TGI Fridays℠ Gift Card, to check the balance or to find the TGI Fridays℠ nearest you, please call 1-888-284-5544 or visit www.fridays.com. TGI Fridays℠ is not a sponsor or co-sponsor of this program and is not affiliated with NGC . Use of the TGI Fridays℠ logos or trademarks requires written approval and is used with permission. ©2014 TGI Friday’s of Rockies, Inc. Please see backside of gift card for complete Terms & Conditions.